Indicate by check whether the registrant (1) has filed all reports required to be filed by Section 13 or 15(d) of the Exchange Act during the preceding 12 months (or for such shorter period that the issuer was required to file such reports), and (2)has been subject to such filing requirements for the past 90 days. Yes X . No . Indicate by check mark whether the registrant has submitted electronically and posted on its corporate Web site, if any, every Interactive Data File required to be submitted and posted pursuant to Rule 405 of Regulation S-T (§232.405 of this chapter) during the preceding 12 months (or for such shorter period that the registrant was required to submit and post such files Yes . No X . Indicate by check mark whether the registrant is a shell company as defined in Rule 12b-2 of the Exchange Act Yes . No X . China Grand Resorts, Inc. (CGND) and its wholly owned subsidiaries Sun New Media Transaction Service Ltd. (SNMTS), China Focus Channel Development Co., Ltd (CFCD) and Key Proper Holdings Limited (KPH), financial statements defined herein below, collectively referred to as the Company or we" have been prepared in accordance with accounting principles generally accepted in the United States of America (US GAAP). The Company was incorporated in the state of Nevada on September 21, 1989 under the name Fulton Ventures, Inc. On September 19, 2002, we changed our name to Asia Premium Television Group, Inc. to more accurately reflect our business at the time. In March 2007, we effected a 1,000 for 1 reverse stock split of our issued and outstanding common stock. Effective on November 16, 2009, we changed our name to China Grand Resorts Inc. to more accurately reflect our new business efforts and effected a 20 for 1 reverse split of our common stock. All shares and per share amounts in these consolidated financial statements and note thereto have been retrospectively adjusted to all periods presented to give effect to the reverse stock split. On August 1, 2009, the Company entered into a subscription and asset sale agreement (the Agreement) with Beijing Hua Hui Hengye Investment Ltd. (Hua Hui), an unaffiliated PRC company. Hua Hui is a PRC real estate construction and development conglomerate that specializes in constructing and developing travel, resorts, hotels, and apartment properties in popular tourist and other destinations within the PRC. Under the Agreement, we received from Hua Hui the commercial income rights to 10,000 square meters of a 17 story apartment building in the Huadun Changde International Hotels Apartment Complex (the Apartment Complex) located in the city of Changde, Hunan Province (Project). The Project is developed by Changde Hua Hui Construction Investment Co., Ltd. (Changde Hua Hui), a 99.33% owned subsidiary of Hua Hui. Changde Hua Hui agrees to convey to us the commercial income rights to 10,000 square meters of the Project. The Apartment Complex consists of a total of 215,000 square meters located on an approximately 3.6 acre piece of land. The Project is comprised of a total 128 apartments, of which we will have the commercial rights to approximately 60 apartments. The commercial income rights means the exclusive right to own and/or receive any and all income and proceeds derived from these apartments. The commercial income rights to 10,000 square meters were valued at approximately $8,777,000 by an independent valuation firm and we agreed to pay a total of $7,317,000 as consideration. In exchange, we agreed to issue to Hua Hui, 2,774,392 shares of our common stock valued at $2.4 per share (the closing price of the Companys common stock on the transaction date, August 1, 2009 after giving effect of 20 for 1 reverse split) for a total stock value of $6,658,536 and transferred to Hua Hui certain other Company assets valued at $658,241. These assets consisted of all of our shares of the GlobStream, certain assets of both Sun New Media Transaction Services Limited and China Focus Channel Development Co., Ltd, and other miscellaneous assets of ours. On September 8, 2009, we satisfied the issuance of the 2,774,392 shares by issuing 832,318 shares to Wise Gold Investment Ltd., a British Virgin Island company acting on behalf of Hua Hui. On that same date, we also issued 1,942,074 shares of common stock to Blossom Grow Holdings Limited, a British Virgin Island company, as escrow agent under an escrow agreement by and among us the escrow agent, and Hua Hui. The escrow agent will hold the escrow shares pending completion of the Project which is expected to occur at or near the end of calendar 2010. If the escrow agent receives written instructions from the Company that the Project is completed in accordance with the terms of the Agreement, the escrow agent will release the escrow shares to Hua Hui. However, if after the projected completion date, the Project has not been completed, the escrow shares will continue to be held at escrow for one year. If after one year, the project still has not been completed, then the Company and Hua Hui will negotiate an agreement to deal with the escrow shares. On December 5, 2011 and September 2, 2012, the Company entered into Supplemental Agreements with Hua Hui and Blossom Grow Holdings Limited, pursuant to which, the escrow agent will hold the escrow shares to August 31 2013. Due to change of decoration structure and style, and the ineffective communications with the construction contractors, Hua Hui has informed us that the Project is expected to be completed during the second quarter of calendar year 2014. On December 2, 2013, the Company entered into another Supplemental Agreement with Hua Hui and Blossom Grow Holdings Limited, pursuant to which, the escrow agent will hold the escrow shares to August 31 2014. All permits concerning the Project have been acquired from governmental authorities, and the construction of the Project is 95% completed as the date of this report. During the escrow period, Hua Hui will be able to vote such shares provided it has reached an agreement with us on such matter(s). Otherwise, the escrow agent will not vote on such matter(s). As a result, Hua Hui and Mr. Menghua Liu, Hua Huis Chairman and majority shareholder and the Companys Chairman and Chief Executive Office, are deemed the beneficial owner of such shares. After giving effect to the transaction, Hua Hui became the Companys majority shareholder and beneficially owns approximately 84.8% Companys outstanding shares. With respect to the 10,000 square meters residential space, Changde Hua Hui performs the actual unit sales. We agree to pay Changde Hua Hui a sales commission of 3% of the unit sales price. As of June 30, 2014, 12 units, or approximately 1,893 square meters were sold. The total sales price is approximately $707,935 (RMB4,354,797). The commercial income rights discussed above means we will receive the net proceeds from sale of the apartments. Net proceed means sales price net of project costs, selling expenses, and other expenses directly related to disposal of the apartments. Project costs are costs clearly associated with acquisition, development, and construction of a real estate project. As defined in ASC 970-605-20. In China, after a real estate project is substantially completed, a real estate development company must submit a project cost report to the local government for approval. A real estate development must book the project costs based on the amount approved by the local government. Because the Project has not been completed and the project costs has not been finalized and approved by the local government, we can not determine the net proceed amount as of the date of this report. Changde Hua Hui agrees to hold the proceeds from sale of the apartments, and deliver the net proceeds to us when the amount is fixed or determinable. Since the Company can not be able to determine the amount of net proceed receivable at the date of this report, and based on ASC 450-30-25-1 A contingency that might result in a gain usually should not be reflected in the financial statements because to do so might be to recognize revenue before its realization. And ASC 450-30-50-1 Adequate disclose should be made of a contingency that might result in a gain, but care shall be exercised to avoid misleading implications as to the likelihood of realization., the company discloses the fact of the sale of the apartments, and the amount of the proceed receivable can not be determined at the reporting date. 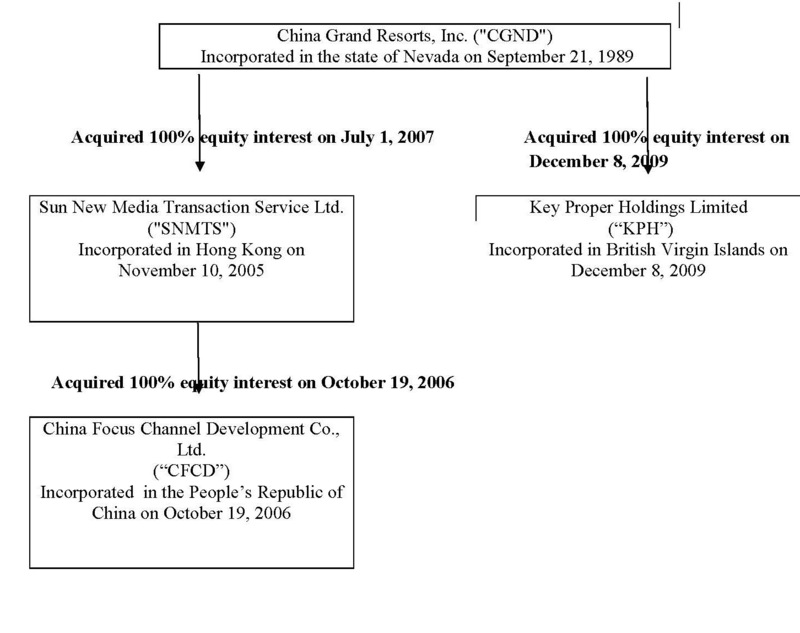 The accompanying unaudited consolidated financial statements of China Grand Resorts, Inc. (CGND) and its wholly owned subsidiaries including Sun New Media Transaction Service Ltd. (SNMTS), China Focus Channel Development Co., Ltd (CFCD) and Key Prosper Holdings Limited (KPH), defined herein below, collectively referred to as the Company or we" have been prepared pursuant to the rules and regulations of the Securities and Exchange Commission and in accordance with accounting principles generally accepted in the United States of America (US GAAP). Certain information and footnote disclosures normally included in the consolidated financial statements prepared in accordance with US GAAP have been condensed or omitted in accordance with such rules and regulations. The information furnished in the interim consolidated financial statements includes normal recurring adjustments and reflects all adjustments that, in the opinion of management, are necessary for a fair presentation of such consolidated financial statements. Although management believes the disclosures and information presented are adequate to make the information not misleading, it is suggested that these interim consolidated financial statements be read in conjunction with the Company's most recent audited consolidated financial statements and notes included in its annual report on Form 10-K for the fiscal year ended September 30, 2013 filed on December 30, 2013. Operating results for the three and nine months ended June 30, 2014, are not necessarily indicative of the results that may be expected for longer periods or the entire year. The Companys consolidated financial statements are prepared in accordance with accounting principles generally accepted in the United States of America (USGAAP) and applicable to a going concern, which contemplates the realization of assets and liquidation of liabilities in the normal course of business. In preparing the consolidated financial statements, we evaluated the period from the balance sheet date through the date the financial statements were issued for material subsequent events requiring recognition or disclosure. No such events were identified for this period. As of June 30, 2014, the Company had an accumulated deficit totaling $11,510,282 and negative working capital $1,408,280.The Company suffered a loss of $120,688 for the nine months ended June 30, 2014 and $210,830 for the year ended September 30, 2013. In view of the matters described above, the appropriateness of the going concern basis is dependent upon continuing operations of the Company, which in turn is dependent upon the Company's ability to raise additional capital, obtain financing and succeed in its future operations. The financial statements do not include any adjustments relating to the recoverability and classification of recorded asset amounts or amounts and classification of liabilities that might be necessary should the Company be unable to continue as a going concern. As a result of the transaction with Hua Hui as discussed in Note (1), we received the commercial income rights of the Project. The Company is actively pursuing additional capital in an effort to fund its ongoing capital requirements, as well as seeking agreements with potential strategic partners to develop a new business strategy, other than its ownership of the commercial income rights to the Project. Cash consists of cash on hand and at banks which are unrestricted as to withdrawal or use. Management believes that the banks which hold the Companys cash are of high credit quality. The Company uses United States dollars (U.S. Dollar or USD or $) for financial reporting purposes. The subsidiaries within the Company maintain their books and records in their respective functional currency, Chinese Renminbi (RMB) and Hong Kong dollars (HK$), being the lawful currency in the PRC and Hong Kong, respectively. Assets and liabilities of the subsidiaries are translated from RMB or HK$ into U.S. Dollars using the applicable exchange rates prevailing at the balance sheet date. Items on the statements of operations and cash flows are translated at average exchange rates during the reporting period. Equity accounts are translated at historical rates. Adjustments resulting from the translation of the Companys financial statements are recorded as accumulated other comprehensive income. There is no assurance that the RMB amounts could have been, or could be, converted into U.S. dollars at the above rates. Based on the Companys assessment, there have been no events or changes in circumstances that would indicate any impairment of long-lived assets as of June 30, 2014 and 2013. There was no asset or liability measured at fair value on a non-recurring basis as of June 30, 2014 and 2013. The Company follows the liability method of accounting for income taxes in accordance with ASC 740 Income Taxes. Under this method, future tax assets and liabilities are recognized for the future tax consequences attributable to differences between the financial statement carrying amounts of existing assets and liabilities and their respective tax balances. Future tax assets and liabilities are measured using enacted or substantially enacted tax rates expected to apply to the taxable income in the years in which those differences are expected to be recovered or settled. The effect on future tax assets and liabilities of a change in tax rates is recognized in income in the period that includes the date of enactment or substantive enactment. The tax loss arising from PRC can be carried forward for five years. Agreed tax losses by respective local tax authorities can be offset against future taxable profits of the respective companies. A valuation allowance is provided for deferred tax assets if it is more likely than not that the Company will not realize the future benefit, or if the future deductibility is uncertain. It is uncertain for the Company that the operating result in PRC will have profit and it is more likely than not that the Company will not realize the future benefit. Therefore, there was no deferred tax asset as of June 30, 2014 and 2013, respectively. In accordance with FASB ASC 605, "Revenue Recognition", we recognize revenue when the earnings process is complete, both title and the risks and rewards of ownership are transferred or services have been rendered and accepted, the selling price is fixed or determinable, and collectability is reasonably assured. Basic earnings (loss) per share is computed on the basis of the weighted-average number of shares of the Companys common stock outstanding during the fiscal years. Diluted earnings (loss) per share is computed on the basis of the weighted-average number of shares of the common stock plus any (loss) effect of dilutive potential common shares outstanding during the year using the if-converted method. As the Company has a loss, presenting diluted net loss per share is considered anti-dilutive and not included in the consolidated statements of operations. The Company accounts for nonmonetary transactions based on the fair value of the assets (or services) involved in accordance with the requirements of FASB ASC Topic 845, Nonmonetary Transactions. Comprehensive income is defined as the change in equity of a company during the period from transactions and other events and circumstances excluding transactions resulting from investments from owners and distributions to owners. Full time employees of the Companys PRC subsidiary participate in a government mandated multi-employer defined contribution plan pursuant to which certain pension benefits, medical care, unemployment insurance, employee housing fund and other welfare benefits are provided to employees. The PRC labor regulations require the Company to accrue for these benefits based on certain percentages of the employees salaries. Cost for the pension and employee benefits for the nine months ended June 30, 2014 and 2013 were $18,620 and $16,453, respectively. In April 2014, the Financial Accounting Standards Board (FASB) issued guidance that changes the criteria for reporting a discontinued operation. According to the new guidance, only disposals of a component that represents a strategic shift that has (or will have) a major effect on an entity's operations and financial results is a discontinued operation. The new guidance also requires expanded disclosures about discontinued operations and disposals of a significant part of an entity that does not qualify for discontinued operations reporting. The guidance is effective beginning January 1, 2015 with early adoption permitted, but only for disposals (or classifications as held for sale) that have not been reported in previously-issued financial statements. The Company does not expect the adoption of the new provisions to have a material impact on our financial condition or results of operations. In July 2013, the FASB issued ASU 2013-11, Presentation of an Unrecognized Tax Benefit When a Net Operating Loss Carry forward, a Similar Tax Loss, or a Tax Credit Carry forward Exists. This standard requires that an unrecognized tax benefits, or a portion of an unrecognized tax benefit be presented on a reduction to a deferred tax asset for an NOL carry forward, a similar tax loss, or a tax credit carry forward with certain exceptions to this rule. If certain exception conditions exists, an entity should present an unrecognized tax benefit in the financial statements as a liability and should not net the unrecognized tax benefit with a deferred tax asset. This standard is effective for fiscal years and interim periods within those years beginning after December 15, 2013. The adoption of this standard did not have a material impact on the Companys financial position, results of operations, and cash flows. In March 2013, the FASB issued guidance on when foreign currency translation adjustments should be released to net income. When a parent entity ceases to have a controlling financial interest in a subsidiary or group of assets that is a business within a foreign entity, the parent is required to release any related cumulative translation adjustment into net income. Accordingly, the cumulative translation adjustment should be released into net income only if the sale or transfer results in the complete or substantially complete liquidation of the foreign entity in which the subsidiary or group of assets had resided. The guidance is effective prospectively beginning January 1, 2014. The adoption of this standard did not have a material impact on the Companys financial position, results of operations, and cash flows. As at June 30, 2014 and 2013, approximately 99% of the Companys cash represented cash balances deposited with banks located in the PRC. According to existing PRC laws and regulations, remittance of these cash balances out of the PRC is subject to various restrictions imposed by the PRC government. Remittance of these cash balances out of the PRC is subject to various restrictions imposed by the PRC government. Depreciation and amortization expenses for the nine months ended June 30, 2014 and 2013 were $1,882 and $12,209, respectively. (a) From June 2009 through December 2009, we received loans from Redrock Capital Venture Limited (Redrock) for working capital purpose. The loans are unsecured, due on demand, and without formal writing loan agreements. The loans amounted to $100,281 as of December 31, 2009 and remained the same amount as of June 30, 2014. Redrock is currently a minority shareholder of the Company. (b) Commencing in October 2009, we began receiving loans from time to time from Hua Hui, our largest shareholder, for working capital purposes. As of June 30, 2014, the amount due to Hua Hui is $1,302,342 which is due on demand and bears interest at the prevailing rate charged by the PRC Central Bank. The loans that we received from Hua Hui in the nine months ended June 30, 2014 and 2013 amounted to $76,594 and $121,268, respectively. The interest accrued for the nine months ended June 30, 2014 amounted to approximately $45,516 and the effective interest rate of the loans was 5.59%. The interest accrued for the nine months ended June 30, 2013 amounted to approximately $39,189 and the effective interest rate of the loans was 5.57%. As of June 30, 2014 and 2013, the Company had 3,272,311 and 3,272,311 shares issued and outstanding, respectively. As of June 30, 2014, the Company had 7,782 common stock warrants outstanding. In 2001, the Board of Directors adopted a Stock Plan (Plan). Under the terms and conditions of the Plan, the Board of Directors is empowered to grant stock options to employees, consultants, officers and directors of the Company. Additionally, the Board will determine at the time of granting the vesting provision and whether the options will be qualified as Incentive Stock Options under Section 422 of the Internal Revenue Code (Section 422 provides certain tax advantages to the employee recipients). The Plan was approved by the shareholders of the Company on September 15, 2001. The total number of shares of common stock available under the Plan may not exceed 100. As of June 30, 2014, no options were granted under the Plan. In December 2009, we relocated our office to a new location in Beijing consisting of 192.70 square meters. The new Beijing office lease is from December 11, 2009 to December 10, 2011 and provides for monthly lease payment of $5,333 with two months period of free rent. In August 2011, we renewed this lease agreement from December 11, 2011 to December 12, 2012. The monthly lease payment is $6,253. Since December 13, 2012, Hua Hui, our majority shareholder, has provided an office to us at no cost. However, Hua Hui may charge us rent in the future. We have not reached an agreement as of the date of this filing. Rental expenses for the nine months ended June 30, 2014 and 2013 was $0 and $12,790, respectively. SNMTS is generally subject to Hong Kong income tax on its taxable income derived from trade or businesses carried out in Hong Kong at 16.5% for the nine months ended June 30, 2014 and 2013. However, as SNMTS has not generated any revenue or income, no provision for Hong Kong income tax has been made. As SNMTS has yet commenced operations, the expenses incurred are not deductible and no loss carry forward was thus resulted. CFCD established in the PRC was subject to the PRC Enterprise Income Tax (EIT) at 33% prior to January 1, 2008. The PRC Enterprise Income Tax Law, among other things, imposes a unified income tax rate of 25% for both domestic and foreign invested enterprises registered in the PRC. The New EIT Law provides a grandfathering on tax holidays which were granted under the then effective tax laws and regulations. The NEW EIT Law also imposes a withholding tax of 10% unless reduced by a tax treaty, for dividends distributed by a PRC-resident enterprise to its immediate holding company outside the PRC for earnings accumulated beginning on January 1, 2008 and undistributed earnings generated prior to January 1, 2008 are exempt from such withholding tax. As the PRC subsidiary is loss status, the Company has not provided for withholding taxes of its PRC subsidiary as of June 30, 2014 and 2013. There is no state of limitations in the case of tax evasions. Accordingly, the income tax returns of China Grand Resorts, Inc. for the nine months ended June 30, 2014 and 2013 are open to examination by the PRC state and local tax authorities. As of June 30, 2014 and 2013, the Company did not have any significant temporary differences and carry forwards that may result in deferred tax. The Company has analyzed the tax positions taken or expected to be taken in its tax filing and has concluded it has no material liability related to uncertain tax positions or unrecognized tax benefits. The Company does not anticipate any significant increases or decreases to its liability for unrecognized tax benefits within the next 12 months. On August 1, 2009, we entered into a subscription and asset sale agreement with Hua Hui. Under the terms of the Agreement, we received from Hua Hui the commercial income rights to 10,000 square meters to a 17 story apartment building in the Huadun Changde International Hotels Apartment Complex located in the city of Changde, Hunan Province (Project). The Project is currently under development by Changde Hua Hui. In exchange, we agreed to issue to Hua Hui 2,774,392 shares of our common stock. As additional consideration, we transferred to Hua Hui all of our shares of the GlobStream Technology Inc., certain assets of both SNMTS and CFCD and certain assets of the Company. According to ASC 845-10-S99, transfers of non-monetary assets to a company by its promoters or shareholders in exchange for stock prior to or at the time of the entitys initial public offering normally should be recorded at the transferors' historical cost basis determined under GAAP. In this transaction, Hua Hui became the controlling shareholder of the Company after it transferred the commercial income rights to the Company. Therefore, the accounting principles in ASC 845-10-S99 were followed and the Company recorded the rights at its historical cost basis, which was internally developed and had zero basis. The Company faces a number of risks and challenges not typically associated with companies in North America and Western Europe, since its assets exist solely in the PRC, and its revenues are derived from its operations therein. The PRC is a developing country with an early stage market economic system, overshadowed by the state. Its political and economic systems are very different from the more developed countries and are in a state of change. The PRC also faces many social, economic and political challenges that may produce major shocks and instabilities and even crises, in both its domestic arena and in its relationships with other countries, including the United States. Such shocks, instabilities and crises may in turn significantly and negatively affect the Company's performance. other matters discussed in this Quarterly Report generally. Consequently, readers of this Quarterly Report should not rely upon these forward-looking statements as predictions of future events. New risk factors emerge from time to time and it is not possible for our management to predict all risk factors, nor can we access the impact of all factors on our business or the extent to which any factor, or combination of factors, may cause actual results to differ materially from those contained in any forward-looking statements. We undertake no obligation to update or revise any forward-looking statement in this Quarterly Report to reflect any new events or any change in conditions or circumstances. All of the forward-looking statements in this Quarterly Report are expressly qualified by these cautionary statements. We were organized under the laws of the State of Nevada on September 21, 1989. We engaged in a variety of business, described in part below, and effected various name changes prior to November 2009 when the name was changed to China Grand Resorts, Inc. Our subsidiary is Sun New Media Transaction Service Ltd. (SNMTS), a company incorporated in Hong Kong, which has a wholly owned subsidiary China Focus Channel Development Co., Ltd (CFCD), a company incorporated in Peoples Republic of China. In December 2009, the Company incorporated Key Prosper Holdings Limited, a company incorporated in the British Virgin Islands on December 8, 2009, with 100% shareholdings. During the three year period prior to December 2007, our principal business was providing marketing, brand management, advertising, media planning, public relations and direct marketing services to clients in the PRC. During December 2007 through January 2008, we re-directed our business towards providing mobile phone based services in the PRC. In January 2008, we divested ourselves of our advertising and marketing business. On August 1, 2009, as mentioned throughout this Form 10-Q, we entered into a subscription agreement with Beijing Hua Hui Investment Holding Ltd., an unaffiliated company organized under the laws of the PRC (Hua Hui). Hua Hui is a PRC real estate construction and development conglomerate that specializes in constructing and developing travel, resort, hotel, and apartment properties in popular tourist and other destinations within the PRC. Under the Agreement, we received from Hua Hui the commercial income rights (described herein) to 10,000 square meters of apartment space in the Huadun Changde International Hotels Apartment Complex located in the city of Changde in Chinas Hunan Province (Project). The Project is currently under development by Changde Hua Hui Construction Investment Limited (Changde Hua Hui), a 99.33% owned subsidiary of Hua Hui. In exchange, we agreed to issue to Hua Hui subject to certain conditions, a total of 2,774,392 shares of our common stock which is valued at $2.40 per share (the closing price of our common stock on the transaction date (August 1, 2009) after giving effect of 20 for 1 reverse split) for a total stock value of $6,658,536. As additional consideration, Hua Hui received from us all of the shares of the GlobStream Technology Inc., our wholly owned subsidiary, certain assets of Sun New Media Transaction Services Limited and China Focus Channel Development Co., Ltd, and certain other miscellaneous assets of us which were valued at $658,241. Hua Hui and its affiliates, including Changde Hua Hui, are a PRC real estate construction and development group that specializes in constructing and developing travel, resort, hotel, and apartment properties in popular tourist and other destinations within the PRC. As a result of the transaction with Hua Hui, we intended to become a leading specialty real estate consulting and marketing company for tourism projects in the PRC. Initially, our plan was to market the commercial rights to the Project that we received from Hua Hui. We further planned on expanding our business by using existing resources and knowhow of our affiliates and other parties to engage in providing consulting and marketing services for real estate developers. However, beginning in late 2009 and continuing through the current quarter, the PRC State Council maintains a number of initiatives designed to cool a perceived overheated real estate market. As a result, the Company has suspended its plans to engage in consulting and marketing services for real estate developers. Presently, apart from the Project (discussed below), we are evaluating other markets and business opportunities, including subject to market conditions its previously proposed real estate consulting business, however, as of the date of the report, we have not committed to any specific market or business opportunity. With respect to the Project, Changde Hua Hui performs the actual unit sales. On December 27, 2013, we entered into a commission agreement with Changde Hua Hui. Under the commission agreement, we agree to pay Changde Hua Hui a sales commission of 3% of the unit sales price and we will receive the net proceeds from sale of the apartments. Net proceeds means the pre-tax sales price net of the proportionate share of project costs attributable to the unit sold, selling expenses, and other expenses directly related to sale of the unit. Changde Hua Hui intends to hold the proceeds from sale of the units, and deliver the net proceeds to us when the final project costs are fixed or determinable. As of the date of this filing, such costs have not been determined by Changde Hua Hui. As mentioned above, the Project consists of 10,000 square meters of apartment space in the concerning Building of the Huadun Changde International Hotels Apartment Complex, a 17 story building, located in the city of Changde, Hunan Province (Project). The Project is currently under construction by Hua Hui. Changde is a popular tourist destination located in Chinas central Hunan province. Upon completion, the Complex will consist of a total of 215,000 square meters located on an approximately 3.6 acre piece of land that has access roads on the North, East, and West. The city is accessible by rail and air and is in close proximity to several tourist, scenic, and commercial areas. The Project is in close proximity to several tourist, scenic, and commercial areas. Construction began on June 1, 2009 and initially was expected to be completed on December 31, 2010. However, due to change of decoration and style implemented by Hua Hui, Hua Hui has informed us that the Project is expected to be completed at the end of calendar year 2014. All permits concerning the Project have been acquired from governmental authorities, and the construction of the Project is approximately 95% completed as of the date hereof. We also have acquired the pre-sale permits for the sale of the apartments from the local real estate authority. The Project when completed will be comprised of a total number of 128 apartments. The units are expected to range in size from 120 square meters to 160 square meters. Under current market conditions, we expect that the price of the apartment units to be approximately RMB3,880 ($631) per square meter, subject to market conditions. The units when sold will be unfurnished. Hua Hui began pre-completion marketing efforts in the mid-calendar 2010. In this regard, Hua Hui currently maintains limited Project advertisements in the Changde airport and in the Changde Morning newspapers. It also maintains an outdoor billboard on the main street of Changde City which displays the Project, and advertises the Project from time to time in the Changde TV and radio markets. Finally, Hua Hui has printed sales brochures, has hosted potential buyers, implemented a text messaging program to potential buyers, and completed a website for the Project. A sales center and several model units with respect to the Project were completed by Hua Hui in late November 2010. Potential buyers can tour these models to gain appreciation of the design, structure and appearance of the units. We have actively collaborated with Hua Hui with regard to the content of information contained in the outdoor billboard and print media, as well as the design of the sales center. We expect to play an active role in Hua Huis future marketing plans. In any pre-completion sale, the amount of the down payment that we will be able to obtain from a buyer is subject to the housing policy of governing real estate authorities. The current policy allows for a down payment ranging from 30% to 50% of the sales price dependent on the property size. As mentioned, Changde Hui Hua acts as the sales agent and will receive a sales commission of 3% of the unit sales price. Changde Hua Hui has informed us that in course of selling the units, it will act in good faith in selling the units and will not act preferentially toward selling its units over the units of the Company. As of June 30, 2014, we have sold 12 units with a total area of approximately 1,893 square meters. These units were sold to residents whose properties were demolished to make space to build our Project. According to the resettlement arrangement with Hua Hui, these residents and the local government, the government granted these residents a priority right to buy our apartment units at a discounted price of RMB 2,300 ($373), which price was established by the local government. We sold the 12 apartment units at the stated price of RMB 2,300 ($373) per square meter (compared to our expected sale price of $631 per square meter). In connection with these sales, Changde Hua Hui received from the buyers a non-refundable deposit of approximately 30% of the total purchase price. The balance of the purchase price will be paid by the local government as resettlement compensation under the agreement and is due when we complete the property ownership registration process for the buyers. This process is expected to be completed in December 2015. In addition to the sale of 12 units completed as of the date of this filing, we expect four sales to other displaced residents to be completed in the near term. The terms of these other transactions are and will be similar to the terms of the prior transactions. Changde Hua Hui is responsible for the sales of the units and received the deposits from the buyers. Changde Hua Hui will pay us the net proceeds from the sale of each unit. Net Proceeds means the pre-tax sales price net of our proportionate share of project costs attributable to the unit sold, selling expenses, and other expenses directly related to disposal of the units. Changde Hua Hui intends to hold the proceeds from sale of the apartments, and deliver the net proceeds to us when the final project costs are fixed or determinable. As of the date of this filing, Changde Hua Hui has not been paid by the government for the balance of the purchase price. It expects to be paid from the government in December 2015. Our estimated working capital budget for the next 12 months is approximately $147,000 which relate principally to corporate overhead. This amount is comprised of approximately $57,000 in professional fees, $70,000 in salaries and related personnel costs, and $20,000 in miscellaneous expenses. We will not incur any costs of marketing the Project. In addition, Hua Hui, our majority shareholder, provides an office located in Beijing to us at no cost; however, Hua Hui may charge us in the future, we have not reached an agreement as of the date of this filing. As a result, we have not included rent on our budget. We expect to generate sales from the Project at the end of calendar year 2014. Thereafter, subject to the foregoing, we believe that revenues from the Project will be sufficient to fund our ongoing working capital needs. During the three months ended June 30, 2014, we incurred general and administrative expenses of $22,853 compared with $21,019 for the three months ended June 30, 2013. The increase in general and administrative expenses is primarily due to increase in consulting and professional fees. We also had $472 in depreciation and amortization for the three months ended June 30, 2014 compared with $898 for the comparable three months ended June 30, 2013. The decrease in depreciation was mainly attributed to the fact that some fixed assets have reached their useful live. Our loss from operations for the three months ended June 30, 2014 was $23,325 compared to $21,917 for the three months ended June 30, 2013. The difference between the periods is due to lower depreciation and amortization expenses and the decrease of general and administrative expenses discussed above. Other expense for the three months ended June 30, 2014 and 2013, respectively is $15,529 and $13,538 which mainly is interest expense related to the loans from Hua Hui. The increase in other expense is a result of higher principal loan amounts from Hua Hui during the current period. We received $12,735 and $30,342 in loans from Hua Hui for the three months ended June 30, 2014 and 2013, respectively. Our loan balance in favor of Hua Hui was $1,302,342 and $1,118,728 as of June 30, 2014 and 2013, respectively. As a result of the foregoing, our net loss was $38,854 for the three months ended June 30, 2014 compared to a net loss of $35,455 for the three months ended June 30, 2013. The difference is due to the reasons discussed above. During three months ended June 30, 2014, we had a foreign currency translation loss of $1,326 compared with a loss of $14,483 for the three months ended June 30, 2013. The difference is due to fluctuation of value of US dollar against RMB. As a result of all of the issues mentioned above, we had a total comprehensive loss of $40,180 for the three months ended June 30, 2014 compared with a total comprehensive loss of $49,938 for the comparable three months ended June 30, 2013. Commencing in 2009, we began the development of our new business strategy discussed above. Since such time, we had no revenues from operations or gross margin for the nine months ended June 30, 2014 and the comparable period in 2013. During the nine months ended June 30, 2014, we incurred general and administrative expenses of $73,300 compared with $90,795 for the nine months ended June 30, 2013. The decrease in general and administrative expenses is primarily due to decrease in rent expense, slightly offset by an increase in professional and consulting fees. Since December 11, 2012, Hua Hui has provided our office space to us at no cost. We also had $1,882 in depreciation and amortization for the nine months ended June 30, 2014 compared with $12,290 for the comparable nine months ended June 30, 2013. This decrease was mainly attributed to the reduction in assets (leasehold improvements) subject to depreciation, as we moved our office in December 11, 2012. Our loss from operations for the nine months ended June 30, 2014 was $75,182 compared to $103,004 for the nine months ended June 30, 2013. The difference between the periods is due to lower depreciation and amortization expenses and the decrease of general and administrative expenses discussed above. Other expense for the nine months ended June 30, 2014 and 2013, respectively is $45,506 and $39,173, which mainly is interest expense related to the loans from Hua Hui. The increase in other expense is a result of higher principal loan amounts from Hua Hui during the current period. We received $76,594 and $121,268 in loans from Hua Hui for the nine months ended June 30, 2014 and 2013, respectively. Our loan balance in favor of Hua Hui was $1,302,342 and $1,118,728 as of June 30, 2014 and 2013, respectively. As a result of the foregoing, our net loss was $120,688 for the nine months ended June 30, 2014 compared to a net loss of $142,177 for the nine months ended June 30, 2013. The difference is due to the reasons discussed above. During nine months ended June 30, 2014, we had a foreign currency translation gain of $1,489 compared with a loss of $26,074 for the nine months ended June 30, 2013. The difference is due to fluctuation of value of US dollar against RMB. As a result of all of the issues mentioned above, we had a total comprehensive loss of $119.199 for the nine months ended June 30, 2014 compared with a total comprehensive loss of $168,251 for the comparable nine months ended June 30, 2013. We finance our operations primarily through cash generated from operating activities, a mixture of short and long-term loans (including loans from affiliates) and issuance of common stock. The net cash used in operating activities for the nine months ended June 30, 2014 was negative $85,258 compared with net cash used in operating activities of negative $89,383 for the nine months ended June 30, 2013. The difference of $4,125 is primarily due to the reduction of other receivables, as we collected the security deposit for the office lease terminated in December 2012, the decrease in net loss and the increase of finance expense during the nine months ended June 30, 2014. The net cash used in investing activities for the nine months ended June 30, 2014 and 2013 was $0. The net cash provided by financing activities for the nine months ended June 30, 2014 was $76,594 compared with net cash provided by financing activities of $121,268 for the nine months ended June 30, 2013. The difference of $44,674 is mainly due to the decrease of loan from related parties during the nine months ended June 30, 2014. The effect of the exchange rate on cash was a gain of $1,483 for the nine months ended June 30, 2014, compared with a loss of $26,228 for the nine months ended June 30, 2013. The difference is due to fluctuation of value of US dollar against RMB. The difference between the closing balance of cash and cash equivalents for the nine months ended June 30, 2014 and 2013 is due to the reasons mentioned above. Beginning from September 2013, we began selling the 10,000 square meters of residential space which we obtained the commercial income rights. As of the date of this report 12 units, or approximately 1,893 square meters were sold. The total sales price is approximately $707,935 (RMB4,354,797). We received the commercial income rights to the 10,000 square meters discussed above and we will receive the net proceeds from sale of the apartments. Net proceeds means sales price net of project costs, selling expenses, and other expenses directly related to disposal of the apartments. Project costs are costs clearly associated with acquisition, development, and construction of a real estate project as defined in ASC 970-605-20. In China, after a real estate project is substantially completed, a real estate development company must submit a project cost report to the local government for approval. A real estate development must book the project costs based on the amount approved by the local government. Because the Project has not been completed and the project costs have not been finalized and approved by the local government, we can not determine the net proceed amount as of the date of this report. Changde Hua Hui will hold the proceeds from sale of the apartments, and deliver the net proceeds to us when the amount is fixed or determinable. We expect to receive portion of the net proceeds in the near future. We continue to experience significant losses from operations. As discussed herein, we anticipate that we will generate sales from the Project commencing at the end of calendar year 2014. However, we nonetheless have an immediate need for capital to conduct our new business endeavors as well as our ongoing working capital needs. We anticipate raising capital through additional private placements of our equity securities, and, if available on satisfactory terms, debt financing. It is conceivable that funding of all or part of the budget required above may come from Hua Hui, our largest shareholder, or Redrock Capital Venture Limited, one of our shareholders. Commencing in June 2009, we began receiving loans from Redrock Capital Venture Limited. As of June 30, 2014, the amount due to Redrock is $100,281, in which the amount is due on demand and bears no interest. In addition, commencing in October 2009, we received loans from Hua Hui, our majority shareholder, in various increments totaling approximately $1,302,342 as the date of this report. These loans are due on demand and bear interest at the prevailing rate charged by the PRC Central Bank on the payment date. $147,000 for corporate overhead, which includes approximately $70,000 in salaries and related costs of personnel, $57,000 in professional fees, and $20,000 in miscellaneous office expenditures. We expect to generate sales from the Project at the end of calendar year 2014. Thereafter, the Company believes that revenues from the Project will be sufficient to support our ongoing capital working needs for the ensuing six to twelve month period. However, our projections are subject to certain risks and uncertainties, including our ability to raise additional funds in the near future. We cannot predict whether we will successful with any of business strategies. Our significant accounting policies are described in Note 2 to our consolidated financial statements for the nine months ended June 30, 2014. We prepare our financial statements in conformity with U.S. GAAP, which requires our management to make estimates and assumptions that affect the reported amounts of assets and liabilities, disclosure of contingent assets and liabilities on the date of the financial statements and the reported amounts of revenues and expenses during the financial reporting period. Since the use of estimates is an integral component of the financial reporting process, actual results could differ from those estimates. Some of our accounting policies require higher degrees of judgment than others in their application. We consider the policies discussed below to be critical to an understanding of our financial statements as their application places the most significant demands on our managements judgment. Information regarding recently issued accounting pronouncements is included in Note 2 to our consolidated financial statements for the nine months ended June 30, 2014. We have not entered into any financial guarantees or other commitments to guarantee the payment obligations of any third parties. In addition, we have not entered into any derivative contracts that are indexed to our own shares and classified as shareholders equity, or that are not reflected in our consolidated financial statements. Furthermore, we do not have any retained or contingent interest in assets transferred to an unconsolidated entity that serves as credit, liquidity or market risk support to such entity. Moreover, we do not have any variable interest in any unconsolidated entity that provides financing, liquidity, market risk or credit support to us or engages in leasing, hedging or research and development services with us. Pursuant to Rule 13a-15(b) under the Securities Exchange Act of 1934 (Exchange Act), the Company carried out an evaluation, with the participation of the Companys management, including the Companys Chief Executive Officer (CEO) and Companys Chief Financial Officer (CFO), of the effectiveness of the Companys disclosure controls and procedures (as defined under Rule 13a-15(e) under the Exchange Act) as of the end of the period covered by this report. Based upon that evaluation, the Companys CEO and CFO concluded that the Companys disclosure controls and procedures are effective to ensure that information required to be disclosed by the Company in the reports that the Company files or submits under the Exchange Act, is recorded, processed, summarized and reported, within the time periods specified in the SECs rules and forms, and that such information is accumulated and communicated to the Companys management, including the Companys CEO and CFO, as appropriate, to allow timely decisions regarding required disclosure. There were no changes in our internal controls over financial reporting that occurred during the nine months ended June 30, 2014 that has materially affected, or is reasonably likely to materially affect, our internal control over financial reporting.